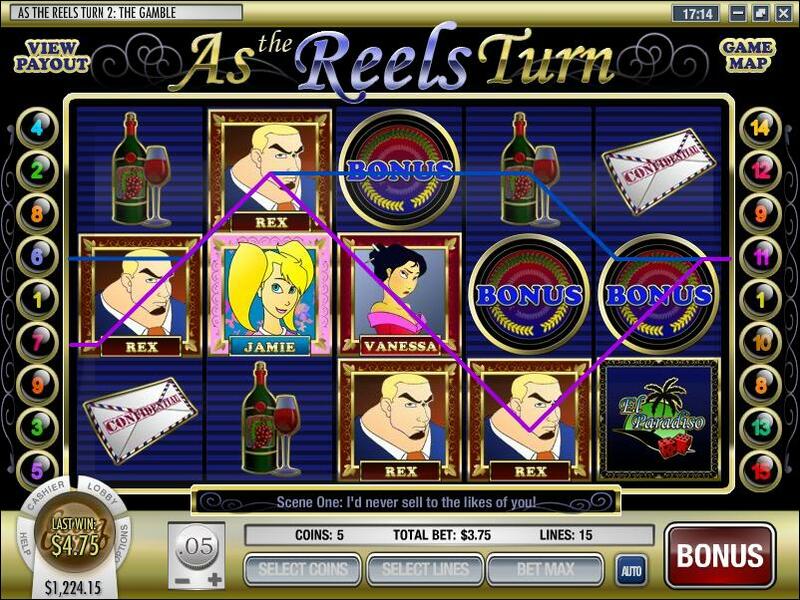 As the Reels Turn is an online casino game that is non-progressive, brought to you by Rival Gaming’s iSlot series. There are a total of 5 reels to spin on this game and there is a 15 payline. The payout percentage of the game is 96.06%. There are many scatter symbols to play, and you have a possible chance of winning at least $2,500 in jackpot money. This is just some of the features that you can read more about in this article. We have no specific recommendations for Rival powered online casinos here at Online Casino Admin.com, but we do recommend a few of the best online casinos available. One of these casinos is the Playtech powered casino Vegas Red. Try this fantastic casino with a $888 sign up bonus right now by clicking the links above or below this post. As The Reel Turn is such a popular game that there are now many sequels for it. There are plenty of different settings for the game in every different sequel that is available play and each sequel picks up where the last one left off at. You can choose between 5 different trails to uncover the story-line for the game. You also have the ability to choose your favorite scene and play it an unlimited amount of times. Visit the map you will see a layout of all of the different scenes that you can play; just choose the one that you like the most and play it. The pokie is one that is soap opera based, and you will see how so as you advanced throughout all of the different levels for the game. If you want to play the game the natural way, then you can go through the levels by moving your way up from one level to the next. There are many great rewards to reap when playing As the Reels Turn. The payout percentage (as mentioned above), is 96.06% which is more than approved for an online pokie machine. The most that you can win from a jackpot is $2,500 which is a rather small amount compaired to standard competition for such games. As The Reel Turns is a game that is known to be very interactive, and those that play get an excitement adrenaline rush. If you have played the first version of the game then you will most likely be prompted to play the 2nd and the 3rd; the game is one that is truly addicting. When playing the reels, receiving more than 3 Ivan pictures will get you 10 free additional spins, so be certain to aim to get those 3 Ivans. In this game there is no wild icon, so if the wild symbol is your thing then it might be better for you to be looking for another alternative for this good looking machine. Or try the great Playtech powered casino at Vegas Red by clicking the links below. Why are the Progressive Slots so Popular?